Manny Ramírez, who with David Ortiz formed the greatest power-hitting tandem in Red Sox history and helped capture the team's only two World Series titles in the last 90 years, yesterday was suspended 50 games as a member of the Los Angeles Dodgers for violating baseball's anti-doping policy. In the latest humiliating bombshell for the national pastime, Ramírez joined a galaxy of superstars whose Hall of Fame-caliber careers have been tainted by their involvement with banned substances. One after another, the purported cheaters have effectively sabotaged Major League Baseball's effort to convince fans that the sport has conquered a drug scandal that has consumed the game for more than two decades. A baseball source told the Globe the substance that triggered Ramírez's 50-game suspension was human chorionic gonadotropin (HCG), a female fertility drug that steroid users sometimes ingest to regulate their natural testosterone levels. HCG has been banned by Major League Baseball since last year and by the International Olympic Committee since 1987. The drug is similar to Clomid, which federal prosecutors have linked to baseball stars Barry Bonds and Jason Giambi. Admitted steroid cheat Jose Canseco last year was sentenced to a year's probation after he was caught smuggling HCG into the United States from Mexico. "It's a tragedy. It's a shame," White House spokesman Robert Gibbs said of Ramírez's fall from grace. "My sense is, it's a great embarrassment on Major League Baseball." Baseball officials did not identify the substance Ramírez used in violating the drug policy. Nor did Ramírez, who waived his right to appeal the suspension. Ramírez said in a prepared statement that the substance was not a steroid but a medication his doctor prescribed for an unspecified personal health issue. "Unfortunately, the medication was banned under our drug policy," Ramírez stated. "Under the policy, that mistake is now my responsibility." Ramírez, who apologized to the Dodgers and their fans for his transgression, reportedly tested positive twice for the banned substance, once in spring training and again recently. The second positive result prompted baseball officials to suspend Ramírez after the Dodgers defeated the Nationals Wednesday to improve their home record to 13-0, the best home start in modern baseball history. "LA is a special place to me, and I know everyone is disappointed. So am I," Ramírez said in his statement. "I'm sorry about this whole situation." Sources close to Ramírez were quoted by Yahoo! 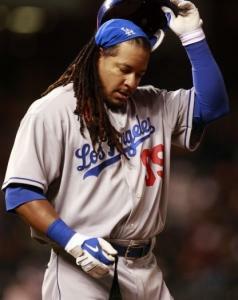 Sports as saying the Dodgers slugger received the medication to address erectile dysfunction. However, it would be unusual for a physician to prescribe HCG to treat erectile dysfunction, according to William McCloskey, a professor of pharmacy practice at the Massachusetts College of Pharmacy and Health Sciences. In the days before Viagra, Cialis, and similar drugs reached the market, HCG was used to treat erectile dysfunction, but its use has greatly diminished because of the new products, McCloskey said. Doctors may prescribe HCG for patients who are unable to tolerate drugs such as Viagra because of high blood pressure, but with all the alternative medications available on the market, "it's kind of hard to assume that's why [HCG] was being used" by Ramírez, McCloskey said. The other legitimate medical uses for HCG are limited largely to treating conditions such as dwarfism and undescended testicles. Ramírez, a 12-time All-Star who has led his league in batting (.349 in 2002), home runs (43 in 2004), and RBIs (165 in 1999), and was named MVP of the 2004 World Series, is the biggest star to be suspended under baseball's anti-doping program since Rafael Palmeiro in 2005. In his statement, Ramírez said he had passed about 15 previous drug tests. In 2000, British cyclist Neil Campbell was suspended a year for testing positive for HCG. In 2006, US speedskater Corey Gahan received a two-year suspension for using the drug, among other performance enhancers. The Austrian ski team at the 2006 Olympics in Turin also was linked to HCG, as have been professional wrestlers and bodybuilders. In addition, baseball players David Bell and Jay Gibbons were cited for alleged HCG use in the 2007 Mitchell Report on the sport's doping crisis. Ramírez, who will turn 37 May 30, generally has ducked any public discussion of doping throughout his 17-year career. In a rare incident, he was asked during an impromptu news conference in spring training in 2004 to share his thoughts on steroids. "That's a stupid question," Ramírez said, turning away from reporters. Last year, Ramírez all but forced his way out of Boston in his anger over the Sox refusal to drop the team's options to renew his $20 million contract in 2009 and 2010. The Sox traded him to the Dodgers July 31 in a three-team deal with the Pirates that sent Jason Bay to Boston. Ramírez all but singlehandedly led the Dodgers out of mediocrity and into the playoffs before they were eliminated in the National League Championship Series by the Phillies. The Dodgers have posted the best record (51-32) in the National League since Ramírez arrived and entered last night with the majors' best record (21-8) this season. Ramírez was batting .348 with six homers and 20 RBIs when he was suspended. The Sox declined in a prepared statement to specifically address Ramírez's suspension, citing league policy. Their statement concluded, "We staunchly support Major League Baseball's drug policy and commend the efforts associated with that program." Ramírez will be lost to the Dodgers until July 3 and will forfeit nearly $7.7 million of his $25 million salary during his unpaid suspension. His loss also will financially damage the Dodgers, who have built their marketing campaign largely around Ramírez and his "Mannywood" persona. "We share the disappointment felt by our fans, our players, and every member of our organization," Dodgers CEO Jamie McCourt said in a prepared statement. Baseball already was reeling from revelations this year about Alex Rodriguez's steroid abuse when the news surfaced about Ramírez's suspension. It was first reported by the Los Angeles Times. Though Ramírez blamed his doctor in part for the violation, major leaguers are regularly reminded every season that any substance they consider using can be reviewed - and even tested - beforehand so they can avoid violating the anti-doping policy. UMass-Boston professor Jean Rhodes, coauthor with Shawn Boburg of the biography "Becoming Manny: Inside the Life of Baseball's Most Enigmatic Slugger," said she was stunned by Ramírez's suspension. Rhodes, a clinical psychologist, said she interviewed many of Ramírez's friends, family members, and former teammates, and never heard even a whisper about steroid use. "All of these conversations were confidential and it could have come up off the record, and it never did," said Rhodes. "At first, I thought it was marijuana. It's all over the place in California and it kind of goes with the Rastafarian look . . . I think this tarnishes Manny's legacy. I don't even know if he makes it into the Hall of Fame now." Bob Hohler can be reached at hohler@globe.com; Globe staffers Tony Massarotti, Kay Lazar, and Mark Shanahan contributed to this report. SURVEY Do you believe Manny? Dirt Dogs Manny Docs revealed | Are we tainted?